If you work with your hands and have dry, cracked skin, this lotion bar should help you. Dandelion oil can heal dry, chapped skin. Lotion bars are also a convenient way to apply a healing hand treatment. Jan explains how to make dandelion-infused oil in two different ways. Once the oil is ready, making the lotion bar is a snap. Aside from the dandelion oil, the bars require just two other ingredients. It’s a very nice recipe. 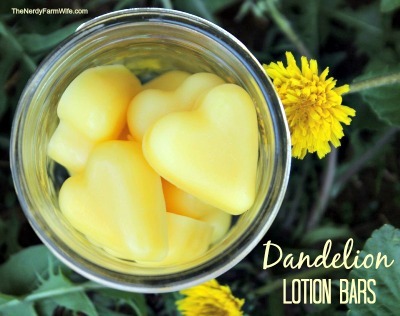 Click on the Homemade Dandelion Lotion Bar Recipe link below to see Jan’s complete recipe.